Horatius Bonar (1808-1889) was a Scottish theologian, poet, and writer of hymns. 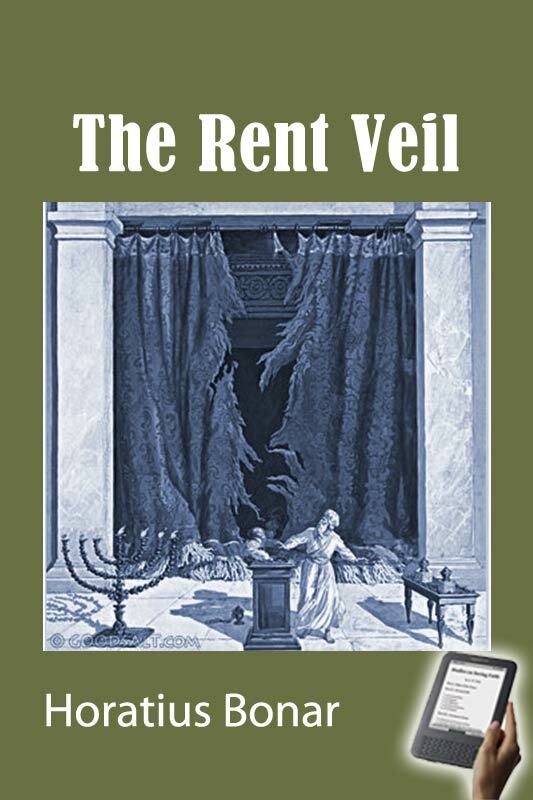 In The Rent Veil, Dr. Bonar provides us with a wonderful treatment of the Atonement. It assumes throughout, that the present condition of the Church on earth is one continually requiring the application of the great sacrifice for cleansing. The theory of personal sinlessness has no place in it. Continual evil, failure, imperfection, are assumed as the condition of God's worshippers on earth, during this dispensation. Personal imperfection on the one hand, and vicarious perfection on the other, are the solemn truths which pervade the whole. There is no day nor hour in which evil is not coming forth from us, and in which the great bloodshedding is not needed to wash it away. This epistle is manifestly meant for the whole life of the saint, and for the whole history of the Church. God's purpose is that we should never, while here, get beyond the need of expiation and purging; and though vain man may think that he would better glorify God by sinlessness, yet the Holy Spirit in this epistle shows us that we are called to glorify God by our perpetual need of the precious bloodshedding upon the cross. No need of washing, may be the watchword of some; they are beyond all that! But they who, whether conscious or unconscious of sin, will take this epistle as the declaration of God's mind as to the imperfection of the believing man on earth, will be constrained to acknowledge that the bloodshedding must be in constant requisition, not (as some say) to keep the believer in a sinless state, but to cleanse him from his hourly sinfulness. Boldness to enter into the holiest is a condition of the soul which can only be maintained by continual recourse to the blood of sprinkling, alike for conscious and for unconscious sin: the latter of these being by far the most subtle and the most terrible,--that for which the sin-offering required to be brought. "If we say that we have no sin, we deceive ourselves, and the truth is not in us." The presence of sin in us is the only thing which makes such epistles as that to the Hebrews at all intelligible. When, by some instantaneous act of faith, we soar above sin, (as some think they do) we also bid farewell to the no longer needed blood, and to the no longer needed Epistle to the Hebrews. "Through the veil, which is His flesh," is our one access to God; not merely at first when we believed, but day by day, to the last. The blood- dropped pavement is that one which we tread, and the blood-stained mercy-seat is that before which we bow. In letters of blood there is written on that veil, and that mercy-seat, "I am the way, the truth, and the life; no man cometh to the Father but by me": and, again, "Through Him we have access, by one Spirit, unto the Father." Every thing connected with the sanctuary, outer and inner, is, in God's sight, excellent and precious. As of the altar, so of every other part of it, we may say, "Whatsoever toucheth it shall be holy" (Exo 29:37). Or, as the Apostle Peter puts it, "To you who believe this preciousness belongs" (1 Peter 2:7, i.e., all the preciousness of the "precious stone"). Men may ask, May we not be allowed to differ in opinion from God about this preciousness? Why should our estimate of the altar, or the blood, or the veil, if not according to God's, be so fatal to us as to shut us out of the kingdom? And why should our acceptance of God's estimate make us heirs of salvation? I answer, such is the mind of God, and such is the divine statute concerning admission and exclusion. You may try the experiment of differing from Him as to other things, but beware of differing from Him as to this. Remember that He has said, "This is my beloved Son, in whom I am well pleased." Say what you like, He is a jealous God, and will avenge all disparagement of His sanctuary, or dishonour of His Son. Contend with Him, if you will try the strife, about other things. It may not cost you your soul. Dispute His estimate of the works of His hand in heaven and earth; say that they are not altogether "good," and that you could have improved them, had you been consulted. It may not forfeit your crown. Tell Him that His light is not so glorious as He thinks it is, nor His stars so brilliant as He declares they are. He may bear with this thy underrating of His material handiwork, and treat thee as a foolish child that speaks of what he knows not. But touch His great work, His work of works,-- the person and propitiation of His only-begotten Son, and He will bear with thee no more. Differ from Him in His estimate of the great bloodshedding, and he will withstand thee to the face. Tell Him that the blood of Golgotha could no more expiate sin than the blood of bulls and of goats, and He will resent it to the uttermost. Depreciate anything, everything that He has made; He may smile at thy presumption. But depreciate not the cross. Underrate not the sacrifice of the great altar. It will cost thee thy soul. It will shut thee out of the kingdom. It will darken thy eternity.